Fruitless Pursuits: Falkor Folklore: Neverending Story Shirt at TeeFury! Falkor Folklore: Neverending Story Shirt at TeeFury! Just as we just posted out Noah Hathaway interview I happened to see that TeeFury's t-shirt of the day is Neverending Story themed! 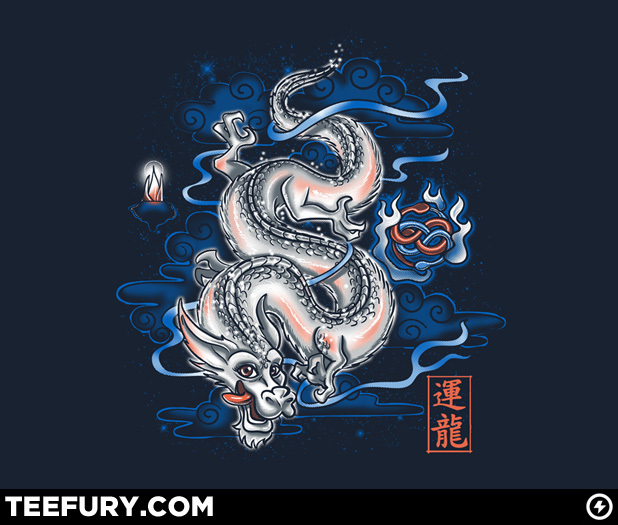 It's Falkor Folklore by Bamboota, and it's a subtle mashup of Falkore and a Chinese dragon. The luckdragon is on our side today, and can be on your back tomorrow (well, in a few weeks). And if anyone can translate the writing at the bottom, I need to know what it says.